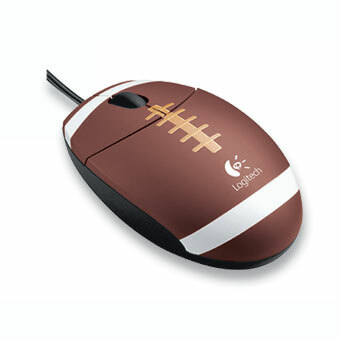 Logitech recently released a new optical mouse targeted at kids into football. The design of the mouse is 2/3 the size of the Logitech MX300 and MX310 mices. The smaller size makes the mouse a great mouse for the little hands of kids. The Logitech Football Mouse is an optical mouse, so there won't be a hassle of getting a mouse pad or having to clean the mouse ball. The football mouse requires no installation and works right out of the box on PCs running Windows� 98, 2000, Me, XP or MACs running OC X+. The mouse can also be connected as a second mouse for the kids. Simply just plug it into any computer with a USB port and you are good to go. Priced at $19.95, the mouse is not an expensive item. So if you still have one of those older mices using trackballs, then the Logitech Football Mouse is an option you should look to for the little ones in your family.